This post was written by Pamela Fong, Research Associate with the Innovation Studies program at WestEd. Over the past five years, our team at the Center for the Future of Teaching & Learning has been leading the Teacher Practice Networks (TPN) initiative, collaborating with education organizations that partner with schools and districts across the nation to help teachers implement instruction aligned to college- and career-readiness standards. We have observed in the TPN that as teachers become more proficient in instructional practices aligned to their state standards, some teachers have stepped into the role of teacher leaders to help their peers make similar instructional shifts and improve their teaching practices. Our data shows that teacher leaders not only help their colleagues become more confident practitioners of standards-aligned instruction, but that teacher leaders, themselves, increase their own sense of efficacy as instructional leaders. In fact, we know from research — ours and others — that teacher leadership works (see our February 2018 CenterView issue, Teacher Leadership Works). Teacher leadership builds instructional leadership capacity, improves school culture, helps to increase teacher retention rates, and improves student learning. We also know that in order for teacher leaders to be successful in helping their peers improve instructional practices, they require key forms of support. In addition to development in leadership skills, sufficient time to plan and work with teachers, administrator support of teacher leadership work, and opportunities to meet with other teacher leaders, they also need professional learning resources for facilitating teacher-to-teacher success. One such resource is a learning cycle framework to structure the learning process that teachers experience, which can lead to improved instructional practices. 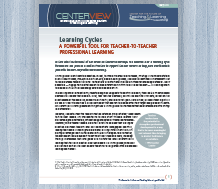 In this CenterView issue, Learning Cycles: A Powerful Tool for Teacher-to-Teacher Professional Learning, learn how teacher leaders participating in TPN use a learning cycle framework as a useful professional learning strategy focused on improving practices. See how three teacher leaders increase their efficacy to lead peers as they implement learning cycles — providing teachers with time to process a new pedagogical approach, test it out in their classrooms, reflect on how well it went, and make refinements to their instructional practice. Understand the importance of teacher reflection throughout a learning cycle and types of questions that teacher leaders can intentionally ask of their peers to think deeply about their practice. Gain tips from teacher leaders on ways to foster a healthy teacher-to-teacher climate for reflection and growth that support fruitful learning cycles. Visit the Learning Cycles: A Powerful Tool for Teacher-to-Teacher Professional Learning resource page to learn more and download your copy.